Are Dog-Bite Injuries Common in Colorado? Pit bulls, which are banned in Denver, are responsible for about two thirds of all fatal dog bites in the U.S.
Colorado is one of the states with strict dog-bite liability laws. Dogs are naturally inclined to bite when they are scared, startled, or need to defend themselves or protect something valuable to them. Although guard dogs and herding breeds can be the worst offenders, any dog can exhibit aggressive behavior if the conditions are right. According to statistics compiled by DogsBite.org, approximately 9,500 people are hospitalized for dog bite injuries each year in the United States. Each day, about 1,000 people go to the emergency room to be treated for serious dog bite injuries. And, in the years between 2005 and 2017, 433 Americans died from injuries related to dog bites. Homeowner and renter insurance policies generally cover dog-bite liability Injuries from dog bites accounted for more than a third of all homeowners insurance liability claims paid out in 2017, at a cost of nearly $700 million. The average dog-bite insurance claim increased more than 90 percent between 2003 and 2017 due to higher medical costs, settlements, judgments, and jury awards to victims. In 2015, 28,000 Americans had reconstructive surgery after being bitten by a dog. The average cost of a dog-bite related hospitalization is $18,200, according to Forbes. Colorado is one of 32 states with strict dog-bite liability laws, meaning that a dog owner will be held strictly liable for any injury or property damage caused by a dog, even if the dog was not provoked. Denver is also the largest jurisdiction in the U.S. with a pit bull ban in place, and it appears to be effective. A 2017 review in the Plastic and Reconstructive Surgery found that for nearly the past two decades, 5.7 percent of the dog bites occurring in Denver were attributed to pit bulls, compared with 54.4 percent occurring in the rest of the U.S. during the same time frame. 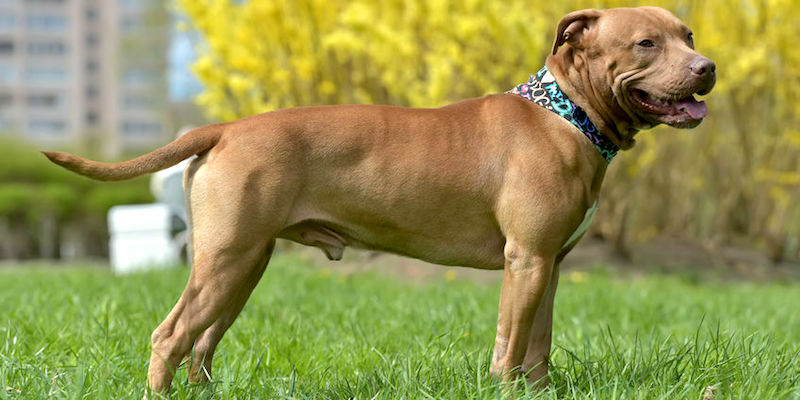 According to the Forbes report, the pit bull is still to blame for the most fatal dog attacks in the U.S., causing 284 fatalities between 2005 and 2017, or 66 percent of the total dog bite fatalities during those years. One particularly disturbing fact behind those statistics is that pit bulls account for just 6.5 percent of the total dog population in the U.S. The Rottweiler came in a distant second, causing 45 fatal attacks during that time frame, and the German shepherd ranked third with 20. Some breeds not normally associated with aggressive behavior, such as the Labrador retriever, also made the list with nine fatal attacks. Bite level 1: Aggressive behavior but the dog’s teeth don’t contact the skin. Bite level 2: The dog’s teeth make contact with the skin but don’t puncture it, although scratches less than a tenth of an inch deep may be apparent, along with minimal bleeding. Bite level 3: One to four punctures from single bite, no puncture deeper than half the length of the dog’s canine teeth. Bite level 4: One to four punctures from a single bite with at least one of the punctures deeper than half the length of the dog’s canine teeth. Deep bruising around the wound or lacerations in both directions may be present. Bite level 5: Multiple bites with at least two level 4 bites, or a multiple-attack incident with at least one level 4 bite in each. Bite level 6: Bite-related fatality occurs. If you have sustained injuries related to a dog bite in Colorado, please contact Colorado personal injury attorney Dan Rosen to discuss your legal options.